Late 1930s are the period when climbers first came to Paklenica. Dragutin Brahm died in an attempt to climb the Anića kuk face for the first time. The route that he attempted to climb, was eventually climbed in 1940 by S. Brezovački and M. Dragman and they dedicated it to him by naming it Brahmov smjer. During the period that followed, few new routes that are nowadays considered to be classical routes in Paklenica, were opened mainly by Croatian climbers. Those routes are Mosoraški (1957 – B. Kambić, B. Kulić), Velebitaški (1961 – D. Ribarović, N. Jakić, M. Mlinac), Klin (1966 – M. Pleško, S. Gilić, N. Jakić) or Funkcija (1969 – N. Čulić, I. Kaliterna). During those years climbers from Slovenia started visiting Paklenica, and they soon took the initiative when it comes to first ascents. Especially active were climbers from Ljubljana that climbed routes such as Vražji, Diagonalka or Forma viva. Following routes remained the last considerable contribution of Croatian climbers for quite some time: Jenjavi (1971) and eight-days climb of Brid klina (1973 – B. Aleraj, M. Čepelak). 1970s represent a new era in climbing here. In 1976 F. Knez first visited Paklenica. He completely changed the concept of climbing and discarded the word impossible. Many of his routes in Paklenica, and there are about forty of them are still considered the most difficult ones. His style has remained modern. Quick ascents with very little gear. It is important to take into consideration his grading method that was usually a whole grade lower than the UIAA grading scale. I. Tomazin was the one that brought the spirit of free climbing in Paklenica. 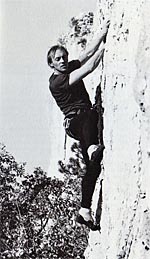 He made the free ascent on Brid za mali Čekić in 1978 (nowadays its grade would be 6c+). It was the firsf route with grade higher than level 6 on the UIAA grading scale. With his parther M. Ivnik he repeated free the Velebitaški route and climbed two new, beautiful and hard routes: Albatros and EI Condor pasa. Early 1980s were the period when difficulty levels of climbed routes suddenly got higher, those routes were better equipped, and many routes were climbed in other rock faces of Paklenica. In that period quick repeated climbs of particular routes also became very popular, as well as climbing a greater number of routes in one day. In that period there were some clashes betweeh so-called traditionalists and climbers that opted for modern trends in climbing. Nevertheless free ascents took root and aid routes climbing also became popular. The first short sports routes were put up in Klanci. The Italian M. Corona equipped first such route (Stimula), and not long after that did his fellow-countryman famous Manolo climbed the route that has remained the most difficult route in Paklenica: Il Marattoneta (8b+). There is also Moskito (8b) climbed by G. Horhager. One of the most active climbers of this period was S. Rehberger that freed routes Rio (7a+) and Cvrčev Stup (6c+) in 1986. In the same year together with T. Slabe he solved what was considered to be the biggest challenge to free climbing in Paklenica, and that is the famous Brid Klina (7c). In the mid 80s famous aid routes were climbed: Spomin (S. Karo, J. Jeglič, F. Knez), Rumeni strah (S. Karo, P. Kozjek) and Tango vertical (S. Karo, S. Škarja). In 1990, Paklenica was visited by brothers Remy, Swiss climbers that climbed two beautiful routes: Rajna and Welcome. Both these routes were climbed in modern style: free, while security bolts were put up in lead. It was during this period that the most difficult aid route were climbed: Jogananda (1989 – M. Praprotnik, M. Ravhekar) that is graded A4. Due to war circumstances there is a period when all climbing activities came to a standstill. Not before the end of 1995 was the Park reopened for visitors and climbers as well. The new era was marked by the new route Waterworld that was climbed by Austrians I. Schalk and G. Grabner. Also the action for reequipping the routes in Klanci and Anića Kuk was also launched by Austrian climbers. In the latest period among the most active climbers are Croatian climbers B. Čujić and I. Matković, that take credit for a whole range of new routes, for example Zlathe godine (7c) or Vila Velebita (7b+) in Anića kuk. 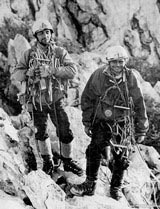 Ranking as the most difficult routes are also those ones equipped and climbed by Italians A. Michelini and his wife L. Ortolani. Those routes are: Alan fjord (7c), Bubamara (7c/c+), Mjesečina (7c/c+)… Italians P. Pezzolato and his female companion S. Gojak can be considered the real “asset” of Paklenica. They take credit for a whole range of beautitul, well-equipped routes in almost all rock faces of Paklenica. Recently there is less and less opportunity for the logical new routes. The route Spider should be mentioned as one of the most difficult routes in this part of Europe. It was a project of Marko Lukič and it took him a few years to equipe and climb this route. The route Zenit is considered as some kind of crown of Anića kuk. It is located in the part of sector Klin and it was equipped in the late 2004. by B. Čujić and I. Matković. And it is one of the longest and the most beautiful routes in the rock of Anića kuk. As an interesting thing we can add the fact that in the begining of 2004. the first B.A.S.E. jump has been made from the Anića kuk rock (R. Pečnik, S. Kranjc).